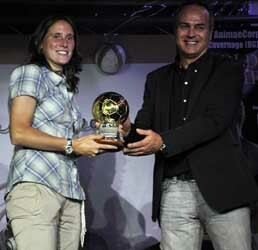 Elisabetta Tona, central defender of Torres, champion of Italy and of the national team, has been awarded by CT Antonio Cabrini as best Italian player. The evening will be broadcast on Rai Sport on the occasion of the delayed Italian Cup final. Tomorrow morning, Tona will be guest live on Rai Uno Mattina with Marzocchi and Luca Pisinicca with an extensive service on the Golden Girls Award. Sunday 27 May, at the exclusive local AnimaeCorpo disco pub, women's football celebrated its stars and awarded the Oscar for women's football. The event, well organized by the company Orobica AnimaeCorpo, was presented by Rai Sport journalist Luca Pisinicca with the participation of the photo model Maddalena Gamba in front of a unique public frame, with over 350 present among athletes, companies and athletes,Pink night of the Oscars"to celebrate the protagonists of the 2011-2012 championship, the guest of honor was the coach of the national team, Antonio Cabrini, who presented the prestigious ITALIAN GOLDEN BALLOON and many personalities from the institutional and sports world, protagonists of the awards. YOUNG PROMISES, PRISONERS AND MISTER! Here are the names of the candidates, IN ORDER ALPHABETIC, to the victory of the Golden Ball 2012, which will be invited, accompanied by their Presidents and Company Managers, to attend the award ceremony that will take place during the evening of the Grand Gala. 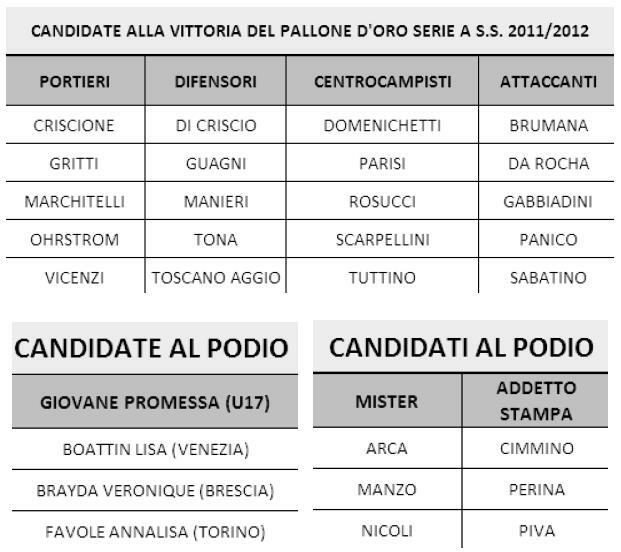 Annalisa Favole (Turin), Lisa Boattin (Venice), Braida Veronique (Brescia) are the Young Promises Under 17 while the Best Mister out of the preferences expressed by their colleagues are: Salvatore Arca (Torres), Mario Manzo (Como) and Mario Nicoli (Florence). The preferences for the category of Best Press Officers has nominated the three gold pens: Fabio Cimmino (Brescia), Daniele Perina (Verona), Marco Piva (Tavagnacco). Please note that, as per regulation, the Technical Jury will decide the final ranking that will establish the winner of the Italian Golden Ball for the 2011 / 2012 season while for the above mentioned categories, they will decide the highest sum of votes expressed by the coaches. Read more: YOUNG PROMISES, PRESS AND MISTER! Draw the rankings of the strongest players of each team, the best coaches and press officers of the A2 series. Through the sovereign vote of the mister adversaries, the organization of 'Orobica has announced the list of winners who will be added to other athletes who are currently ex-fair with teammates. We publish the list of awards that will be held on Sunday 27 May from 20.00 hours at the exclusive AnimaeCorpo Live Restaurant & Show Club - Cavernago (BG) in the presence of the CT of the senior National Antonio Cabrini. The award-winning athletes are invited to collect the prize as well as the coaches and press officers. With immense pleasure and honor, the Organizing Committee is pleased to announce that the CT of the major national Antonio Cabrini will be the distinguished and special guest of honor at the Golden Girls Awards 2012 and will award the winner of the Italian Golden Ball. Golden Girls, the candidates for the "Golden Ball of Italian"
For the categories Young Promise Under 17, Best Mister and Best Press Officer will communicate the candidates to the podium. Please note that, as per regulation, the Technical Jury, the members of which will shortly be announced, will decide the final ranking that will establish the winner of the Italian Golden Ball for the 2011 / 2012 Season. Having verified the ex aequo in the voting referred to the "Strongest for Role" (Goalkeepers, Defenders, Midfielders and Attackers) and the Young Promises U17, the Technical Jury will decide the final ranking that will establish the winner / winner of each category, making the victory of the Italian Golden Ball is even more compelling and not at all obvious.